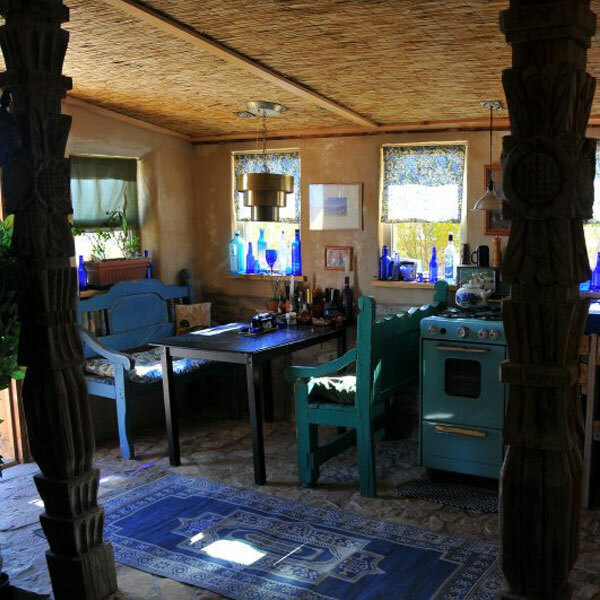 The Blue House is made out of Papercrete (disaggregated telephone books, cement, sand and water), so it’s wonderfully quiet and holds temperature well. 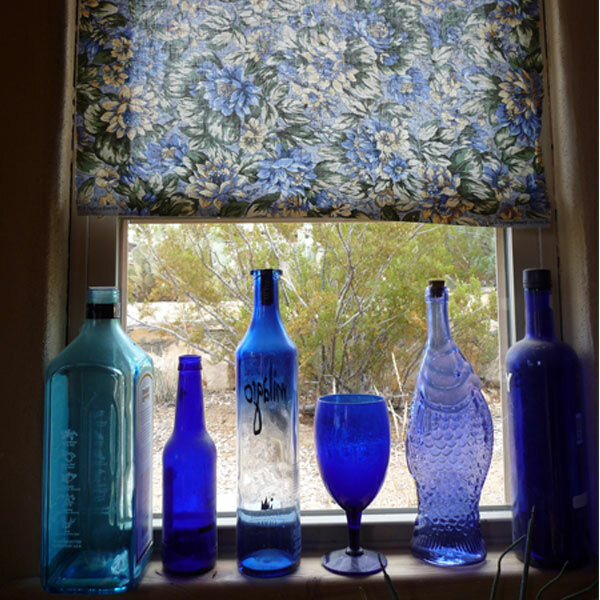 It has been decorated in remembrance of Monet, so it’s a rather blue house, and has birds everywhere, inside and out. This is a “sustainable” rental in that the lights are all solar powered, the water is rain catchment and, of course, the building is recycled telephone books. 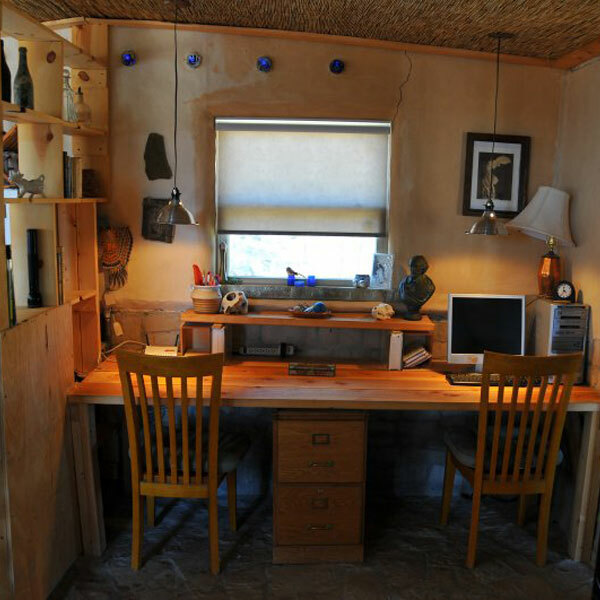 However, there is full electricity in every room so computers and cell phones can be charged. 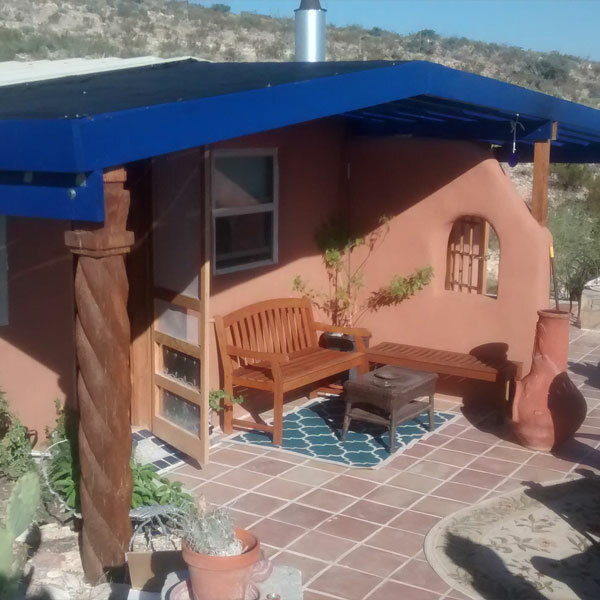 With 500 square feet, it features a full sized bed in the bedroom (with French doors onto a patio and a wood burning chiminea) and a full sized futon in the main room. 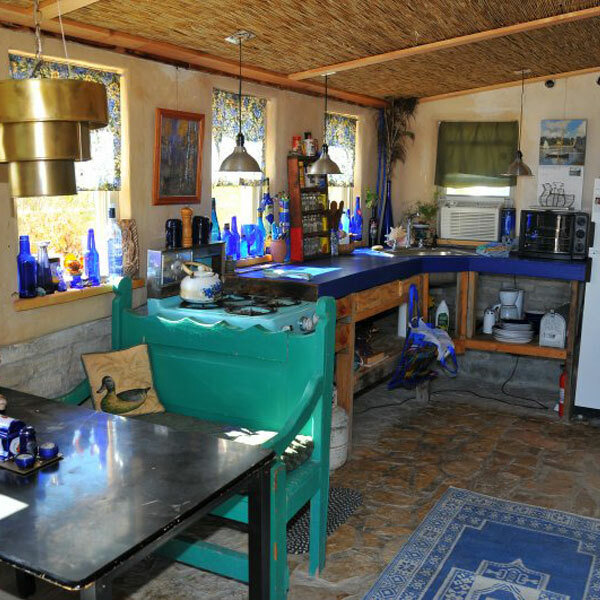 It has a complete kitchen (refrigerator, stove, toaster oven, dishes) and an indoor bathroom. While the lights are solar powered, the fridge and hot water heater are propane, so if community power shuts off, this house is still stylin’. There are also heaters and A/C galore. On the main porch outside there is another wood burning chiminea, a full sized futon for star-gazing or outdoor sleeping, a grill, and a sitting area so you can enjoy the view. There is a telephone line and WiFi (no TV). 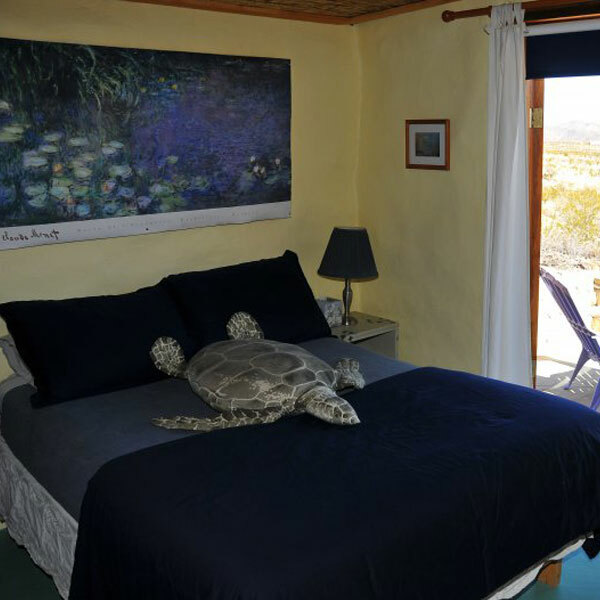 The Blue House is $200 a night plus tax, with a 2 night minimum stay (3 night minimum during the busy season). We like kids and dogs, and 4 person maximum normally (call for special requests). The building is recycled telephone books, the lights are all solar powered, the water is rain catchment. There is full electricity on every receptacle so computers and cell phones can be charged. It’s wonderfully quiet and holds temperature well. It is a 500 square foot structure that can sleep 4 people. A couple can rest comfortably in the full sized bed in the bedroom. There is also a full sized futon in the main room. Included is a complete kitchen with all the essentials: refrigerator, stove, toaster oven, pots, pans, dishes, etc. Enjoy a private indoor bathroom with shower, toilet, and sink. The main porch area features a wood burning chiminea, a full sized futon for star-gazing, a grill, and a sitting area so you can enjoy the view. 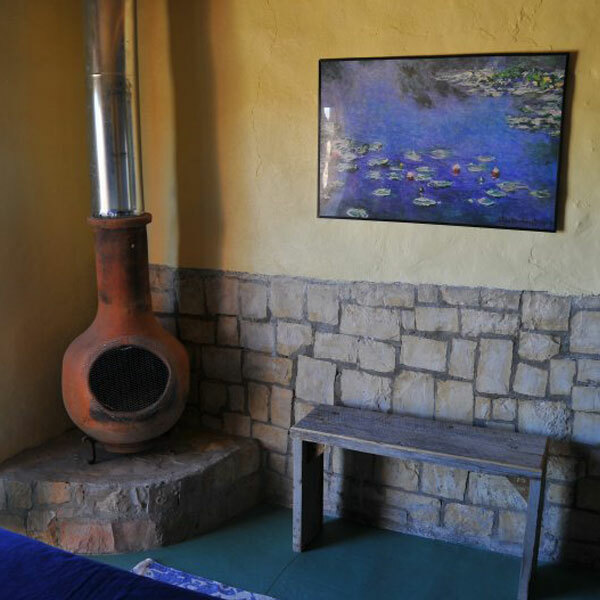 Don't wait, book the Blue House today. 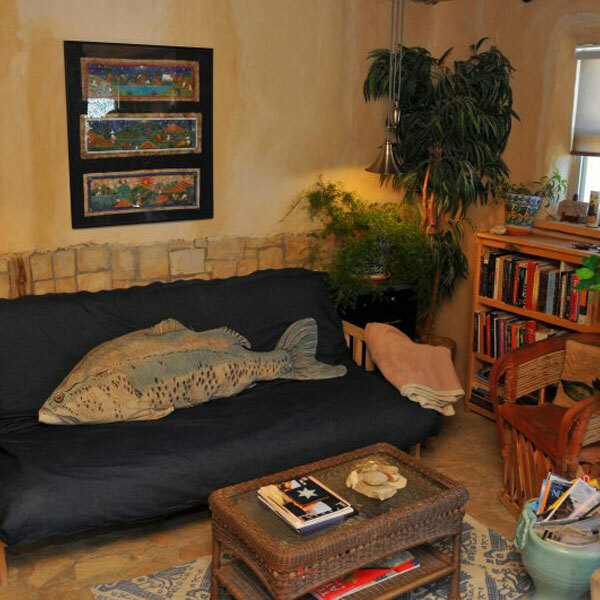 Cynta’s got a unique, soulful home and cool stories to share about the area. I plan on coming back some day, and would definitely stay here again. We were really blown away by the beautiful and meticulously adorned rustic cottage. We felt like we had our own little slice of heaven.